HOMESTEAD, Fla.— The crystal-clear water and the different types of bright green trees that surround Biscayne National Park make it the perfect learning environment for young minds. The park has plenty to offer when it comes to activities for children and the park’s staff provides numerous opportunities for them to learn about their home region and its history. A coral reef is a subtle part of the entrance sign at Biscayne National Park (Staff photos). Usually held in the later afternoon, this program allows for kids to be creative and learn about a different topic about the park every time. “This will help foster an appreciation for the environment and a sense of discovery,” said Mark Adam, a ranger at Biscayne National Park. Arts and crafts are among the activities in which the kids engage. Recently, the theme for the fest was babies. One of the activities was for the kids to make seahorses and put them on a cloth backdrop in order to learn about the uniqueness of the seahorse. The children are given a special passport that gets punched when one of the five activities have been completed. If they complete all the activities a special button is given as a memorable reward for what they accomplished. Another popular program that is offered for kids is the education program at the park. According to Maria Beotegui, a BNP ranger, the program is curriculum-based as well as based on state standards. “We use the parks as classrooms,” said Beotegui. Through this program kids are able to come to the park and relate the topics that they are learning in school to the environment. “We try to present the curriculum from school in real world settings,” said Beotegui. The program also includes ranger ranger visits to different schools to give lectures on various topics. For fifth and sixth graders this program is especially interesting because the rangers take them on a three-day camping trip out to nearby Elliott Key in the park. 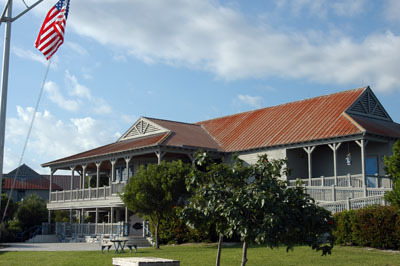 Family Fun Fest activities take place on the grounds of the Fascell Visitor Center. About 25 kids and chaperones are taken out and given the opportunity to live in the outdoors and learn how to be efficient and of course learn about their surroundings. “Hopefully they will realize all of South Florida was once like this,” said Gary Bremen, a park ranger spokesperson for the park. The kids get to learn how to put up a tent all by themselves and get to experience events that they don’t do every day, like camp fires and star gazing. “Our hope is simply exposing the kids to resources of the park,” said Bremen. For kids who want to learn in depth information about the national park, there is the Junior Ranger Program. According to Adam, this program allows for kids to get actual experience in case they want to become a ranger some day at a national park. In order to become a junior ranger, a national parks booklet needs to be completed. The booklet is filled with activities like matching food chains to different animals, learning about endangered species, finding out what causes fires and word puzzles. The book includes activities for visiting three of the four national park units in South Florida— the Big Cypress National Preserve, Biscayne National Park and Everglades National Park. Each page is packed with bright colors and pictures that help kids absorb and apply what they are learning. 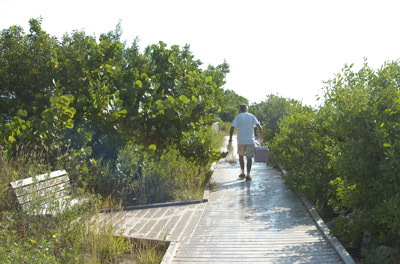 Visitors can stroll along the walkway that extends into the bay at Biscayne National Park’s Dante Fascell Visitor Center. “This makes it special for kids, helps them question their environment,” said Adam. Once the portion of the booklet that applies to Biscayne National Park is completed, the child receives a badge that officially makes them a junior ranger. If the entire booklet is completed, kids receive a badge for every park featured in the book as well as a special patch. For a more low key adventure, seventh and eight graders can participate in the park’s electronic field trip. The trip takes kids to an underwater excursion and gives them a tour of areas like the mangrove shoreline and one of the largest coral reef tracts. The electronic field trip also reveals the relationship between the park’s four ecosystems and how they affect the environment. This engaging and informational field trip can be done online from home or at the park with a ranger. 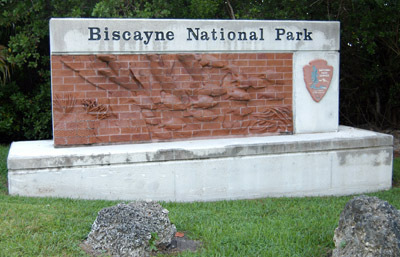 Biscayne National Park is a place where kids can grow and learn about the different aspects of their environment. With so many activities at their fingertips the park is sure to get its environmental conservation and preservation message across to kids and families alike and provide an enjoyable experience at the same time. 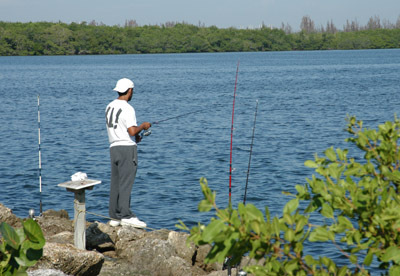 Fishing is a popular activity for families visiting Biscayne National Park’s Dante Fascell Visitor Center. Directions to the park are available at http://www.nps.gov/bisc/. Family Fun Fest is held at the Dante Fascell Visitor Center in Convoy Point. The fest is usually held from 1 to 4 p.m. If you are interested in the junior ranger program booklets are available in the visitor center as well. For information about camping or any other questions about the park call 305-230-7275.